The Los Angeles-based seafood restaurant Water Grill is coming to Orange County. The new eatery is slated to open in fall 2016. 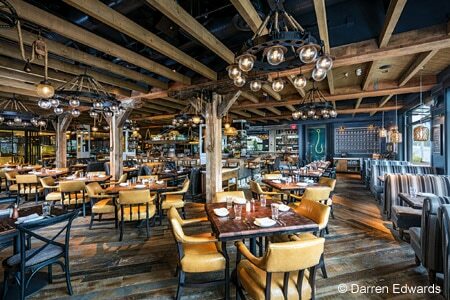 Like its sister restaurants in downtown Los Angeles, Santa Monica and San Diego’s Gaslamp District, the restaurant will present a rotating menu of upscale seafood dishes, emphasizing sustainable ingredients. Water Grill, 3300 Bristol St., Costa Mesa, CA 92626, no phone. Kona Grill is opening up its first California location in Orange County. The venue will be located in the Irvine Spectrum, and is slated to open in February 2016. Like the other locations, guests can expect an array of sushi and Pacific Rim-inspired contemporary entrees. You'll also be able to pair your meal with wine, beer, cocktails or sake. Kona Grill, Irvine Spectrum, 71 Spectrum Center Dr., Irvine, CA 92618, no phone. The high-end Japanese eatery Nobu is making its way to Orange County. The restaurant, which has locations dotted all over the globe, is slated to open in late 2016 as part of the radical redesign of Newport Beach’s Lido Marina Village. Like the other locations, it will feature sushi, izakaya fare and signature dishes inspired by chef and restaurant namesake Nobu Matsuhisa. Nobu, Lido Marina Village, Newport Beach, CA 92663, no phone. ARC Food & Libations executive chef Noah Blom had announced he would launch a duo of different culinary concepts in Costa Mesa’s perpetually hot shopping and dining center South Coast Collection. Now open is Restaurant Marin, a fast-casual eatery patterned after a modern diner. The Guild Club, which will be reminiscent of a classic supper club, complete with 19th-century design motifs, is set to debut soon. The two restaurants will be managed by DirtySexyHappiness Hospitality Group, the business Blom co-owns with his wife, Marin Howarth. Restaurant Marin and The Guild Club, South Coast Collection, 3321 Hyland Ave., Ste. G, Costa Mesa, CA 92626, 949-500-5561. The Ritz Prime Seafood, the long-standing Fashion Island eatery that closed its doors in 2014, has re-emerged at a new location. The restaurant, which was known for its take on classic continental cuisine, seafood and cocktails, is housed in the waterfront space along Newport Beach’s Mariners Mile, formerly occupied by the Chart House. The Ritz Prime Seafood, 2801 W. Coast Hwy., Newport Beach, CA 92663, 949-720-1800. The popular New York City food cart The Halal Guys has opened up a brick-and-mortar location in Costa Mesa. Much like its original NYC cart, the restaurant is serving up a simple selection of fast-casual Mediterranean fare such as chicken and rice plates and gyros. Lunch & Dinner daily. The Halal Guys, 3033 Bristol St., Costa Mesa, CA 92626, 714-850-1080. Amar Santana to Appear on "Top Chef"
Chef Amar Santana (Broadway by Amar Santana and the forthcoming Vaca) will compete on season 13 of Bravo's "Top Chef." The season premiere date is set for December 2, 2015. Broadway by Amar Santana, 328 Glenneyre St., Laguna Beach, CA 92651, 949-715-8234. Scott's Restaurant & Bar in Costa Mesa has announced that it is closing its doors after 26 years. The restaurant, which has long been an iconic dining venue among the city’s South Coast Plaza and theatre district, will be serving its final meals in January. The location is slated to be filled with the Los Angeles-based, high-end seafood concept Water Grill by August 2016. Scott's Restaurant & Bar, South Coast Plaza, 3300 Bristol St., Costa Mesa, CA 92626, 714-979-2400. Tamarind of London has closed its doors after four years of serving high-end Indian cuisine. The Newport Beach restaurant, which was an offshoot of the original United Kingdom restaurant, gave no specific reason for its shuttering. Plans to occupy the now-empty space with a new dining concept have yet to be announced. Tamarind of London, Crystal Cove Promenade, 7862 E. Coast Hwy., Newport Beach, CA 92657, no phone.